We strive to provide comprehensive eye care to our patients/ learn more about all the services we provide. We will do our best to accommodate your busy schedule. Contact us for an appointment! Welcome to Kregg Koons OD, Inc. The doctors and staff would like to welcome you to our practice. Whether you're looking for new stylish frames or have questions about your contact lenses, we're here to offer you personal and expert advice. At our office quality is our goal. With our experienced staff and the comprehensive services we provide - going far beyond just selling glasses and contact lenses - we've got you covered. Drs. Koons, Lenig, Shelley and Davis have served the community for over 40 years. 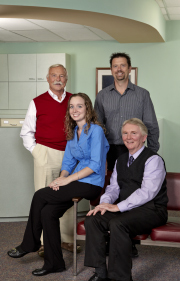 We accept MOST vision insurance including: VSP, Eyemed, Davis, Spectera, Medicare and Medicaid. NEW PATIENTS ALWAYS WELCOME! Call today for a comprehensive eye examination with our highly skilled and trained doctors. Make an appointment today. See your future more clearly. Great eye care begins with regular eye exams. We provide eye care for Adults, Children and Seniors. Call today. Over 1000 frames from which to choose. Glasses for every occasion! See what we have to offer. Search for the Right Frames Here! We offer comprehensive eye care! Comprehensive eye care includes: Providing eyeglasses, contact lenses, routine and pediatric exams. Monitoring for Diabetes, Macular Degeneration and Cataracts. Treatment of Glaucoma, Dry Eyes and other ocular health related conditions requiring medications. Whether elegant or sporty, stylish or pragmatic, with Dr. Kregg Koons you'll always find the right glasses. We have a wide selection of high-quality frames. We have recently added Ray Ban, Coach, Kate Spade, Harley-Davidson, Nike, Vera Bradley, IZOD and Michael Kors to our large frame selections. We have a wide range of prices to choose and strive to make your eyeglass purchase a pleasant experience. We have over 900 frames to choose from! Would you like to go without glasses for a short while or always? We'd be happy to personally advise you in selecting which of the many types of contact lenses we carry is the right one for your needs. Today many contact lens options are available. Daily disposables are an inexpensive option for the occasional wearer. Allow us to help you decide which contact brands and types are best for your eyes. Our friendly team provides all the services of an expert in one stop. 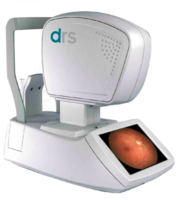 The latest in technology to help diagnose and treat many ocular diseases and refractive problems. We offer the new Reichert 7CR with corneal response technology to diagnose glaucoma better than most older testing. Our office has now added a new state of the art DRS retina camera. Fully automated and rapid results. EVERY new patient will have a retinal photograph taken of their eyes to allow your doctor to monitor your ocular health as well as any future changes that may occur within your eyes. Our visual field testing utilizes the Humphreys Frequency Doubling Technology making our ability to detect disease more easily.